The Kardashians will never meet Cubans like Andrés Fidel Alfonso Rodríguez as they tape their reality show, because for Alfonso and other Cuban political prisoners, there is nothing entertaining about the reality of Cuba. Alfonso, 57, an activist with the Pro Human Rights Group with the Andrei Sajarov Foundation and the National Civic Resistence Front. has been in jail since Dec. 24, 2013. He has served about half of a 4-1/2-year prison sentence for "assault." In prison, he has continued with his resistance to regime, refusing to wear the uniform of a common criminal and paying the consequences. In response, he has carried out at least one hunger strike in protest. 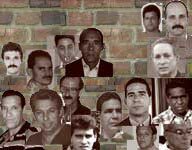 The Castro dictatorship made at least 5,351 politically-motivated arrests in the first four months of 2016, the non-governmental Cuban Commission on Human Rights and National Reconciliation said Tuesday. At the current monthly pace, by sometime in July this will be the worst year for political repression since the commission began counting in 2010. The latest numbers are a result of the dictatorship "trying to silence dissenting voices and any form of peaceful public demonstrations of discontent," the commission said. And why wouldn't the regime do just that. It's not like the United States, and the rest of the world, has shown much interest in holding the Castros accountable for how it treats the Cuban people. In fact, with a presidential visit, the loosening of what's left of the so-called "embargo" and other moves, the U.S. has rewarded the dictatorship as it has doubled down on its bad behavior. According to the commission, there were at least 1,380 arrests in April. That was only the third-highest monthly count this year -- but the fourth-highest since January 2014, an indicator of how much repression has spiked in recent months as ties between the U.S. and Cuba have gotten closer. At the current average pace of 1,338 arrests per month, by some time in July the dictatorship will break the record of 8,899 arrests set in 2014, according to the human rights commission. For details on each arrest in April, read the commission's report here. Not willing to let Cubans demonstrating for freedom upset their May Day party, the Castro dictatorship Sunday unleashed another day of repression, moving to block Damas De Blanco and other activists from taking to the streets to demand respect for their human rights, the end of political repression and the release of political prisoners. At least 31 activists were arrested on Sunday, a day after more than 200 activists with the Patriotic Union of Cuba were arrested. I wonder if this is the "real Cuba" these tourists will be allowed to see.